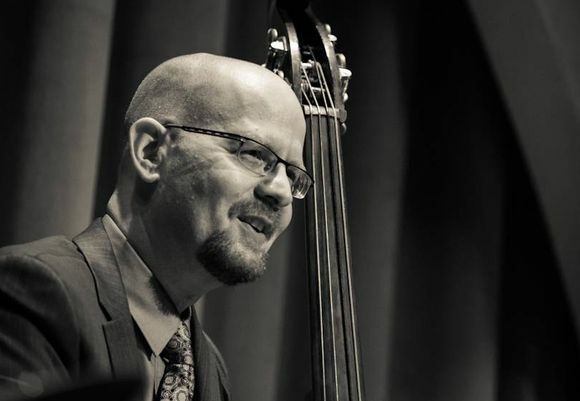 After having performed throughout the world with some of the jazz world’s biggest names as a tenor saxophonist, Michael Karn has once again crisscrossed the globe as a top call bassist. Growing up in Rochester NY, Michael became obsessed with the tenor saxophone and in 1984 entered New York University’s jazz program to study with modern tenor great, Joe Lovano. In 1988 Michael entered the New York scene, and for more than 20 years worked with artists such as Ray Charles, Harry Connick Jr., Charles Earland, and Toshiko Akiyoshi while recording two albums as a leader on the Criss Cross Jazz label. In 2007 Michael began to seriously pursue the bass and within a couple of years was working with some of New York’s best musicians, including tenor great Lew Tabakin and a concert at Jazz at Lincoln Center’s Rose Hall with jazz vocal legend Jon Hendricks. In 2010 Michael began playing with the Vanguard Jazz Orchestra (VJO) and quickly established himself as the band’s first call sub. In addition to numerous Monday nights at the Village Vanguard, Michael has traveled with the VJO throughout the U.S., Canada, Europe and Japan. In February 2012 Michael performed with NEA Jazz Master Jimmy Heath’s big band, as part of a concert at Lincoln Center’s Avery Fisher Hall. Since then Michael has played with Jimmy and his equally legendary brother, and fellow Jazz Master Albert “Tootie” Heath on numerous occasions including engagements at the Blue Note, the Village Vanguard, and the 2013 Chicago Jazz Festival. In 2015 Michael had the opportunity to travel to Japan with yet another jazz legend, vocalist/pianist Freddy Cole, performing for a week at Tokyo’s Cotton Club. And most recently Michael began working with guitarist/vocalist, John Pizzarelli and in a short time has appeared with him throughout the the U.S. and Canada. Highlights with Pizzarelli’s quartet include weeklong engagements at two of New York’s top jazz clubs, Birdland and the Jazz Standard, as well as Washington D.C.’s legendary Blues Alley. With John and his wife, singer Jessica Molaskey, Michael participated in a concert at Northridge California’s Valley Arts Center which was recorded for broadcast on Pizzarelli and Molaskey’s syndicated radio show, Radio Deluxe. Michael also appears on Molaskey’s upcoming Joni Mitchell themed c.d. In addition to these great artists Michael has also performed/recorded with George Coleman, Frank Wess, Houston Person, Bob Wilber, Joe Lovano, Bennie Wallace, Walt Weiskopf, Harry Allen, Craig Handy, Grant Stewart, Eric Alexander, Ken Pleplowski, Harold Mabern, Barry Harris, Johnny O’Neal, Mike LeDonne, David Hazeltine, Michael Weiss, Bucky Pizzarelli, Gene Bertoncini, Peter Bernstein, Jimmy Cobb, Al Foster, Victor Lewis, Lewis Nash and Dennis Mackrel.